The fastest acting premium ice melter on the market, Safe Step Mag Chloride 8300 works in extremely cold temperatures. The unique crystal shape provides rapid ice penetration and prevents product from scattering to where you don’t need it. 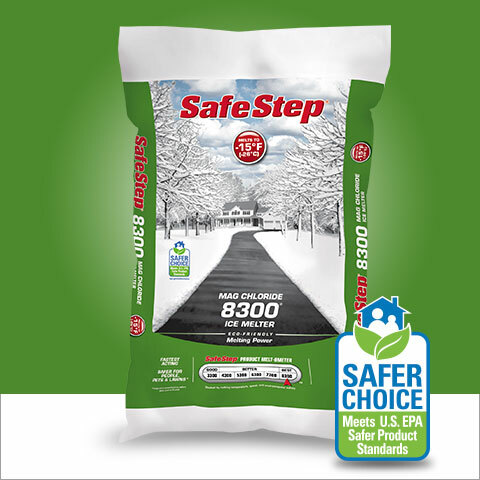 Safe Step Mag Chloride 8300 is 100 percent magnesium chloride hexahydrate, which means it is gentler on vegetation and concrete when used as directed. Designated a "Safer Choice" by the U.S. EPA, Safe Step Mag Chloride 8300 demonstrates our commitment to the health and safety of people, pets, plants and the environment.